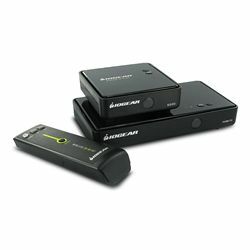 Stream uncompressed full high-definition 1080p with 3D support, along with 6-channel digital audio, up to 100 feet away using this video transmitter and receiver kit. You can use it to wirelessly connect a second HDMI television, in another room, to your entertainment center equipment in your main media room. You can even use the pass-through IR system to control media players at the base station. No line of site is required and the signal passes easily through walls and ceilings. Kit includes transmitter, receiver, remote control, IR blaster cable, 2 AC adapters, 2 AAA batteries and 1 HDMI cable. Requires HDMI video source and HDMI display. 3D formats require compatible hardware and media. 1 out of 2 find this review helpful.